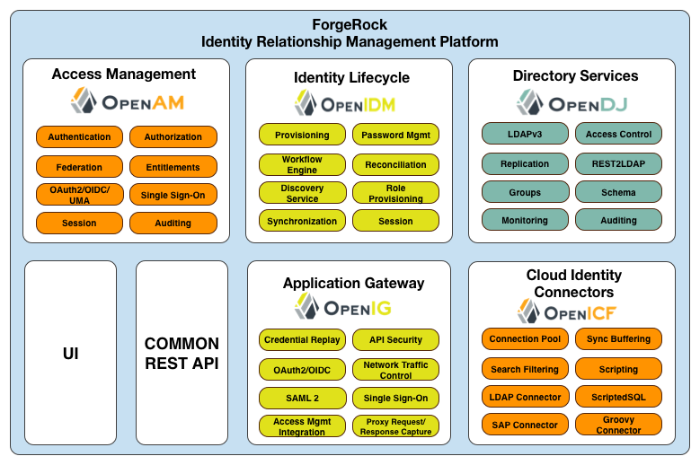 "ForgeRock IRM Platform" illustrates the ForgeRock IRM platform. 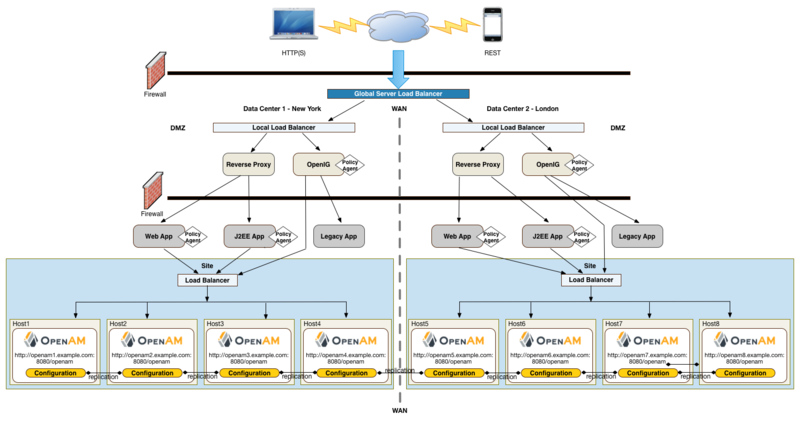 "OpenAM Architecture" illustrates the OpenAM architecture. ClientSDK-13.5.2-11.jar OpenAM's default distribution .war file includes the core server code with an embedded OpenDJ directory server, which stores configuration data and simplifies deployments. The distribution includes an administrative graphical user interface (GUI) Web console. During installation, the .war file accesses a bootstrap file to obtain the fully qualified domain name, port, context path, and the location of the configuration folder. OpenAM provides a client SDK for developers to code extensions for their web applications to access OpenAM's services. The client SDK contains the Java packages, classes, property files, and sample code to help you develop your code. ExampleClientSDK-CLI-13.5.2-11.zip OpenAM provides client SDK examples to help you run them on OpenAM. The zip distribution file contains setup scripts and samples that you can run to learn how to use the client SDK. ExampleClientSDK-WAR-13.5.2-11.war The example client SDK also comes in a .war file, which installs on your container. Fedlet-13.5.2-11.zip OpenAM provides a core server-only .war file without the OpenAM Console. This setup is often used in multi-server deployments wherein the deployments is managed using a full server instance using the ssoadm command-line tool. The OpenAM server installs with an embedded OpenDJ directory server. OpenAM provides an OpenAM Fedlet, a light-weight SAML v2.0 service provider. The Fedlet lets you set up a federated deployment without the need of a fully-featured service provider. IDPDiscovery-13.5.2-11.war OpenAM provides an IdP Discovery Profile (SAMLv2 binding profile) for its IdP Discovery service. The profile keeps track of the identity providers for each user. OpenAM-13.5.2-11.war OpenAM provides a smaller subset of the OpenAM SDK, providing client-side API to OpenAM services. The Client SDK allows you to write remote standalone or Web applications to access OpenAM and run its core services. OpenAM's distribution .war file includes the core server code with an embedded OpenDJ directory server, which stores configuration data and simplifies deployments. The distribution includes an administrative graphical user interface (GUI) Web console. During installation, the .war file accesses properties to obtain the fully qualified domain name, port, context path, and the location of the configuration folder. These properties can be obtained from the boot.properties file in the OpenAM installation directory, from environment variables, or from a combination of the two. openam-soap-sts-server-13.5.2-11.war OpenAM provides a SOAP-based security token service (STS) server that issues tokens based on the WS-Security protocol[a]. SSOAdminTools-13.5.2-11.zip OpenAM provides an ssoadm command-line tool that allows administrators to configure and maintain OpenAM as well as create their own configuration scripts. The zip distribution file contains binaries, properties file, script templates, and setup scripts for UNIX and windows servers. SSOConfiguratorTools-13.5.2-11.zip OpenAM provides configuration and upgrade tools for installing and maintaining your server. The zip distribution file contains libraries, legal notices, and supported binaries for these configuration tools. Also, you can view example configuration and upgrade properties files that can be used as a template for your deployments. 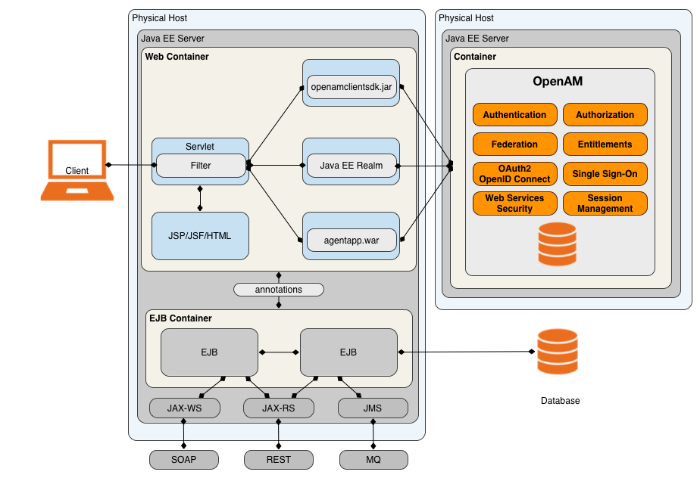 [a] OpenAM also provides REST-based STS service endpoints, which you can directly utilize on the OpenAM server. ForgeRock's OpenAM product is built on open-source code. ForgeRock maintains the OpenAM product, providing the community an open-source code repository, issue tracking, mailing lists, and web sites. ForgeRock also provides commercial releases of fully tested builds. ForgeRock offers the services you need to deploy OpenAM commercial builds into production, including training, consulting, and support. Determine if OpenAM will be deployed behind a load balancer with SSL offloading. If this is the case, you must ensure that the load balancer rewrites the protocol during redirection. If you have a policy agent behind a load balancer with SSL offloading, ensure that you set the policy agent's override request URL properties. Tune OpenAM's JVM, caches, LDAP connection pools, container thread pools, and other items. For information on tuning OpenAM, see "Tuning OpenAM" in the Administration Guide. Default keystores exist in the config-dir/openam/ path, with several self-signed keys and identical passwords. For more information about the default keystores in OpenAM and their demo key aliases, see "Managing Certificates and Keystores" in the Administration Guide. You must therefore plan to secure the deployment as described in "Securing OpenAM" in the Administration Guide. As part of the overall plan, include not only tasks to develop and maintain performance tests, but also to provision and to maintain a pre-production test environment that mimics your production environment. Security measures in your test environment must also mimic your production environment, as changes to secure OpenAM as described in "Planning Security Hardening", such as using HTTPS rather than HTTP, can impact performance. In this section, "upgrade" means moving to a more recent release, whether it is a patch, maintenance release, minor release, or major release. For definitions of the types of release, see "Release Levels and Interface Stability" in the Administration Guide. "OpenAM Deployment Example" presents an example topology of a multi-city multi-data-center deployment across a wide area network (WAN). The example deployment is partitioned into a two-tier architecture. 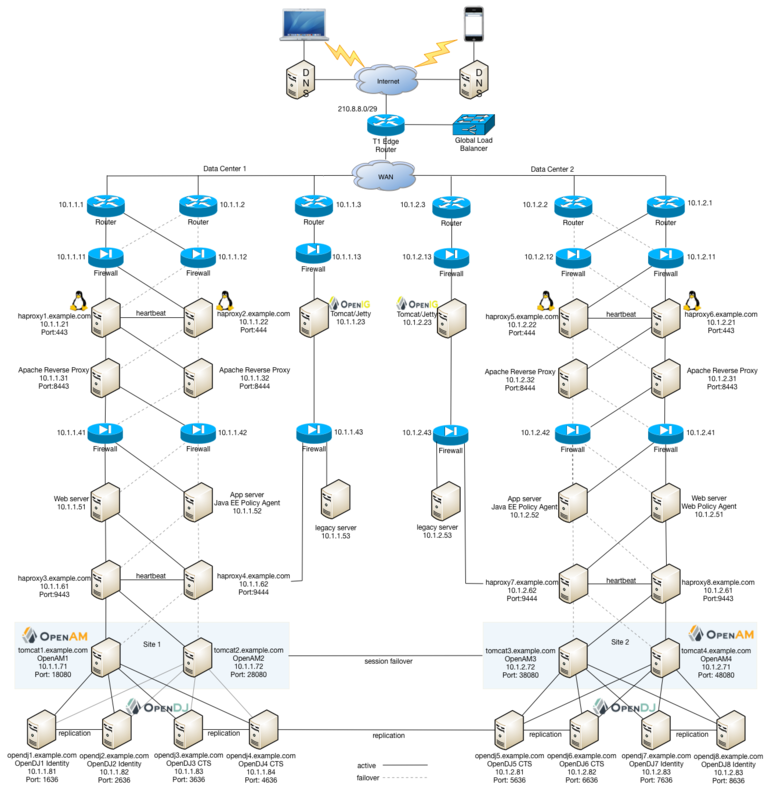 The top tier is a DMZ with the initial firewall securing public traffic into the network. The second firewall limits traffic from the DMZ into the application tier where the protected resources are housed. 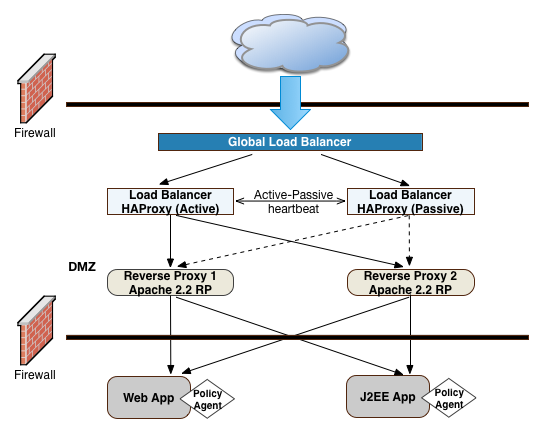 "OpenAM Frontend Load Balancer Reverse Proxy Layer" illustrates one possible deployment using HAProxy in an active-passive configuration for high availability. 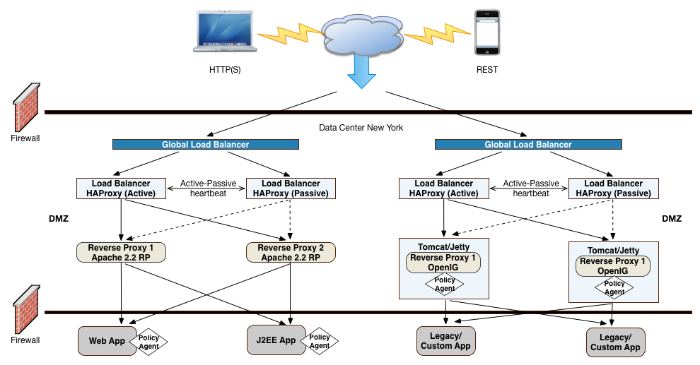 The HAProxy load balancers forward the requests to Apache 2.2 reverse proxy servers. For this example, we assume SSL is configured everywhere within the network. "OpenAM Frontend Load Balancers and Reverse Proxies with Agent" shows a simple topology diagram of your Web tier with agents deployed on your reverse proxies. The dotted policy agents indicate that they can be optionally deployed in your network depending on your configuration, container type, and application. The application tier is where the protected resources reside on Web containers, application servers, or legacy servers. The policy agents intercept all access requests to the protected resources on the Web or app server and grants access to the user based on policy decisions made on the OpenAM servers. For a list of supported Web application containers, see "OpenAM Web Application Container Requirements" in the Release Notes. Because OpenAM is Java-based, you can install the server on a variety of platforms, such as Linux, Solaris, and Windows. For a list of platforms that OpenAM has been tested on, see "OpenAM Operating System Requirements" in the Release Notes. Session failover requires that all servers in a site use the same Core Token Service, which is replicated across all servers. For more information, see "Setting Up OpenAM Session Failover" in the Installation Guide. "OpenAM Application Tier Deployment" shows a possible implementation using RedHat Linux servers with OpenAM installed on each server. You can implement routing software, like Keepalived in such a deployment. If you require L7 load balancing, you can consider many other software and hardware solutions. 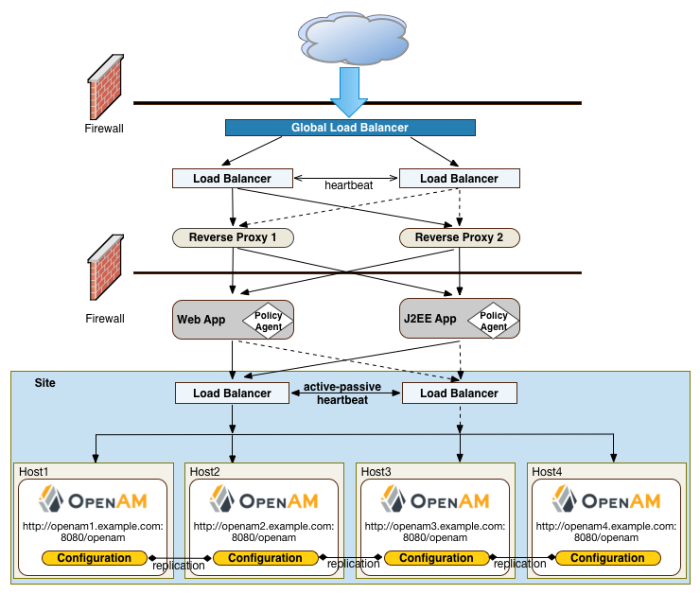 OpenAM relies on OpenDJ's SDK for load balancing, failover, and heartbeat capabilities to spread the load across the directory servers or to throttle performance. One possible configuration (seen in "OpenAM Site Deployment With a Single Load Balancer") is to set up a load balancer with multiple OpenAM servers. You configure the load balancer to be sticky using the value of the OpenAM cookie, amlbcookie, which routes client requests to that primary server. If the primary OpenAM server goes down for any reason, it fails over to another OpenAM server. Session data also continues uninterrupted if a server goes down as it is shared between OpenAM servers. You must also ensure that the container trusts the load balancer. One problem with "OpenAM Site Deployment With a Single Load Balancer" is that the load balancer is a single point of failure. If the load balancer goes down, then the system becomes inoperable. Another deployment variation is to set up multiple redundant sites, typically across a WAN network, which provides high availability for stateful sessions through system and session failover. This setup can be seen in "OpenAM Site Deployment With Multiple Sites" If the load balancer in one site goes down, the other site can resume processing requests with the authenticated user session running without interruption. If an OpenAM server goes down, it fails over to another OpenAM server while also keeping the authenticated user session active with uninterrupted service. For more information, see "Installation Considerations for Multiple Servers" in the Installation Guide. Identity Data Stores. For identity repositories, OpenAM provides built-in support for LDAP and JDBC storage systems. You can implement a number of different directory server vendors for storing your identity data, allowing you to configure your directory servers in a number of deployment typologies. For a list of supported data stores, see "Data Store Requirements" in the Release Notes. If OpenAM does not support your particular identity data store type, you can develop your own customized plugin to allow OpenAM to run method calls to fetch, read, create, delete, edit, or authenticate to your identity store data. For more information, see "Customizing Identity Data Storage" in the Developer's Guide. You can configure the Data Store authentication module to require the user to authenticate against a particular identity data store for a specific realm. OpenAM associates a realm with at least one identity repository and authentication process. When you initially configure OpenAM, you define the identity repository for authenticating at the top level realm (/), which is used to administer OpenAM. From there, you can define additional realms with different authentication and authorization services as well as different identity repositories if you have enough identity data. For more information, see "Configuring Realms" in the Administration Guide. Configuration Data Stores. OpenAM stores configuration data in the embedded OpenDJ directory server. Configuration data includes authentication information that defines how users and groups authenticate, identity data store information, service information, policy information for evaluation, and partner server information that can send trusted SAML assertions. For a list of supported data stores, see "Data Store Requirements" in the Release Notes. SAML keys are stored in the configuration store and are thus replicated. Also, OpenAM's signing keys are shipped with a test certificate. If you upgrade the keystore, you need to redistribute the certificates to all nodes so that they can continue to communicate with each other. For more information, see "Managing Certificates and Keystores" in the Administration Guide. CTS traffic is volatile compared to configuration data, so deploying CTS as a dedicated external data store is advantageous for systems with many users and many sessions. For more information, see "Configuring the Core Token Service" in the Installation Guide. "OpenAM Site Deployment With External Datastores" shows a basic back end deployment with separate external identity, configuration, and CTS data stores. You can use load balancers to spread the load or throttle performance for the external data stores. Although not shown in the diagram, you can also set up a directory tier, separating the application tier from the repositories with another firewall. This tier provides added security for your identity repository or policy data. "OpenAM Example Deployment Configuration Diagram" shows a simplified configuration diagram of the example deployment presented in this chapter (shown in "OpenAM Deployment Example"). The example deploys the various servers on Linux hosts. 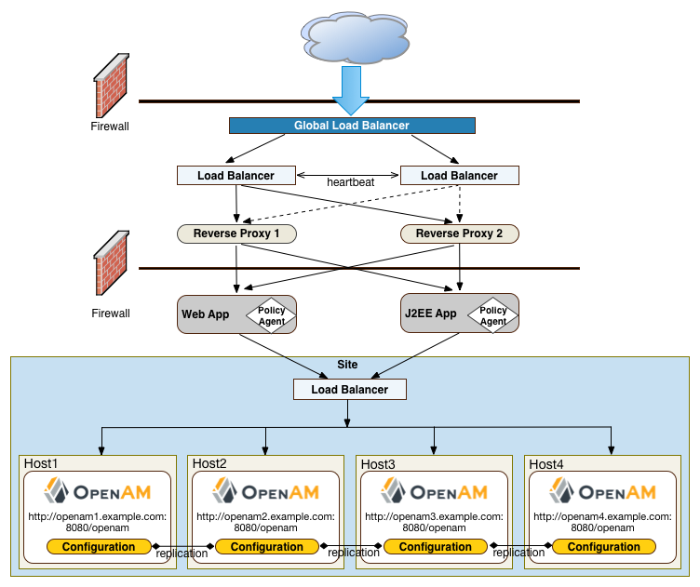 Deployments that require always-on service availability require some sort of load balancing solution at minimum between OpenAM and OpenAM client applications. The load balancer itself must be redundant, too, so that it does not become a single point of failure. Illustrations in "Example Deployment Topology", show multiple levels of load balancing for availability and firewalls for security. When you need failover across sites, one of the costs is (redundant) WAN links scaled for inter-site traffic. OpenAM synchronizes configuration and policy data across sites, and by default also synchronizes session data as well. OpenAM also expects profiles in identity data stores to remain in sync. As shown in "Example Deployment Topology", the deployment involves directory service replication between sites. Also, you must consider the requirements for non-functional testing, covered in "Planning Tests". 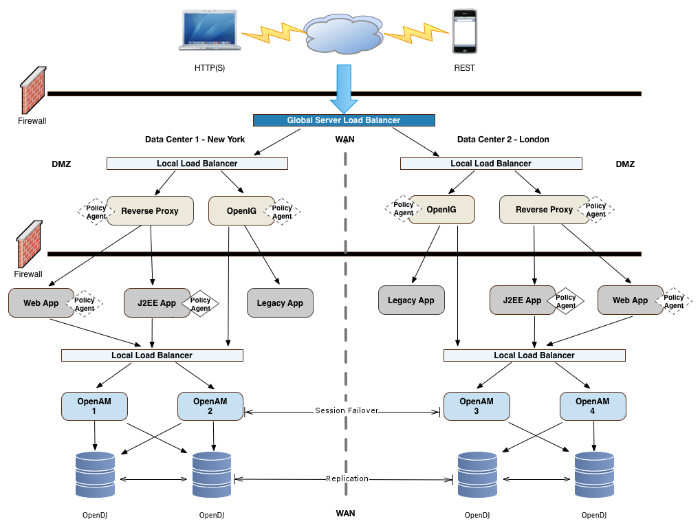 While you might be able to perform functional testing by using a single OpenAM server with the embedded OpenDJ server for user data store, other tests require a more complete environment with multiple servers, secure connections, and so forth. Performance testing should reveal any scalability issues. Performance testing should also run through scenarios where components fail, and check that critical functionality remains available and continues to provide acceptable levels of service. To measure rates of policy evaluations, you can monitor policy evaluation counts over SNMP. For details, see "SNMP Monitoring for Policy Evaluation" in the Administration Guide. You can also gather statistics about CTS operations over SNMP. For details, see "Monitoring CTS Tokens" in the Administration Guide. OpenAM stores data in user profile attributes. OpenAM can use or provision many profile attributes, as described in "To Configure a Data Store" in the Administration Guide. The number of connections and data caching depending on server tuning, as described in "Tuning OpenAM" in the Administration Guide. If OpenAM uses the embedded OpenDJ directory server, then the memory needed depends on what you store in the embedded directory and what you calculated as described in "Sizing For Service Levels". The embedded OpenDJ directory server shares memory with the OpenAM server process. By default, the directory server takes half of the available heap as database cache for directory data. That setting is configurable as described in the OpenDJ directory server documentation. As described in "Disk Storage Requirements", the largest disk I/O loads for OpenAM servers arise from logging and from the embedded OpenDJ directory server writing to disk. You can estimate your storage requirements as described in that section. For details about audit logging configuration, see "Configuring Audit Logging" in the Administration Guide. For details about debug logging configuration, see "Debug Logging" in the Administration Guide. Prepare the Directory Servers. Prepare the configuration directory server, OpenDJ for the core token service (CTS), and the LDAP identity repository. For information on installing data repositories, see "Preparing For Installation" in the Installation Guide. Obtain the OpenAM Software. You should obtain a supported ForgeRock release of OpenAM or an archive build. For the latest stable version of OpenAM, click Enterprise Downloads. Set up your Realms. Within OpenAM, set up your realms and realm administrators if any. For more information on realms, see "Configuring Realms" in the Administration Guide. Configure Session State. Configure sessions as stateful or stateless. For more information on session state, see "Configuring Session State" in the Administration Guide. Install Another OpenAM Instance. Set up an identical instance of your first OpenAM instance. For information on installing multiple OpenAM servers, see "Installation Considerations for Multiple Servers" in the Installation Guide. Secure OpenAM. 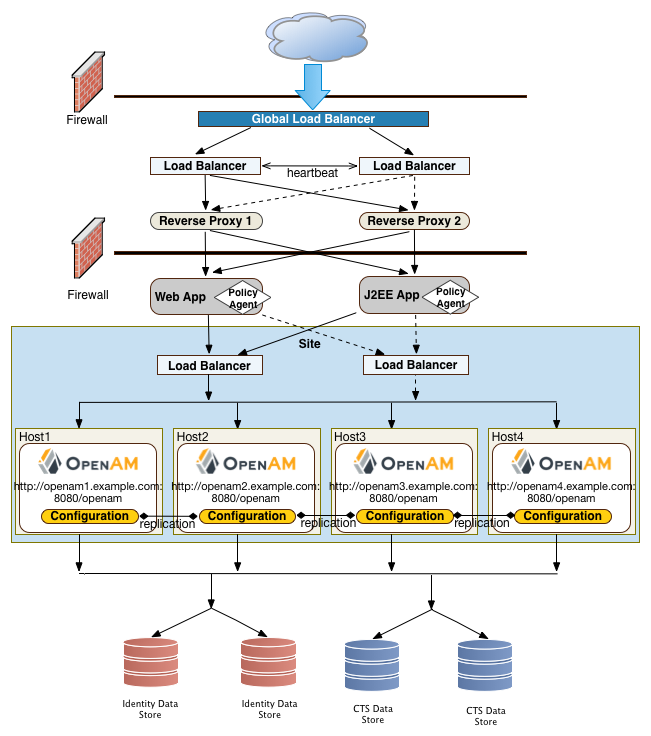 Configure OpenAM to access external resources over HTTPS and LDAPS. Set up secure cookies and certificates. For more information, see "Securing OpenAM" in the Administration Guide. Configure High Availability. 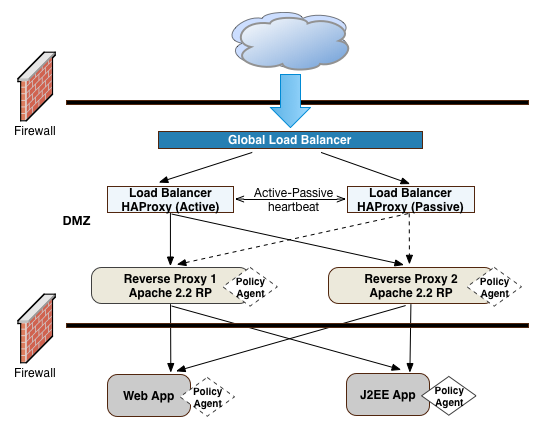 Configure the load balancers, reverse proxies, and site(s). Configure OpenAM for session failover and server failover. 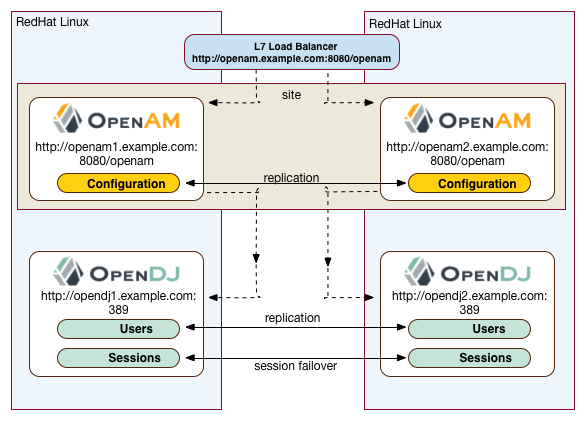 For simple instructions to deploy OpenAM behind a load balancer, see Deploying OpenAM behind a load balancer. For an example of a reverse proxy with OpenAM, see Simple Apache Reverse Proxy for OpenAM with Certificate-Based Authentication. For information on configuring sites, see "Installation Considerations for Multiple Servers" in the Installation Guide. Prepare the Policy Agent Profiles. Prepare the policy agent profile, agent authenticator, policy agent configuration, bootstrap configuration for a Java EE or Web policy agent. For more information, see "Configuring Policy Agent Profiles" in the Administration Guide. Customizing OpenAM. Customize OpenAM for your organization. For information on customizing the OpenAM end-user pages, see "Customizing the OpenAM End User Pages" in the Installation Guide. Plan Application and Host Backup. Determine your backup strategy including LDIF exports, file system backups, tar files, and so forth. Also, consider log rotation and retention policies. For more information on backups, see "Backing Up and Restoring OpenAM Configurations" in the Administration Guide. Remove OpenAM. If required, remove OpenAM with or without the console. Remove setup and configuration tools. Remove the Java EE and/or Web policy agents. Remove OpenIG. For more information on removing OpenAM, see "Removing OpenAM Software" in the Installation Guide.